Hey Bettina, I uploaded a bunch of pics to your flickr group. One of the pics is a panorama of the whole thing (pretty big) :). Anyway, am so glad someone bought it. I'm completely amazed at its beauty and symbolism. Not sure if you know, but it represents, from Yoga, the chakras. Where we landed is the Crown chakra located at the top of your our) heads. :) Also known as: Cosmic Consciousness Center, "I AM" Center, Sahasrara. 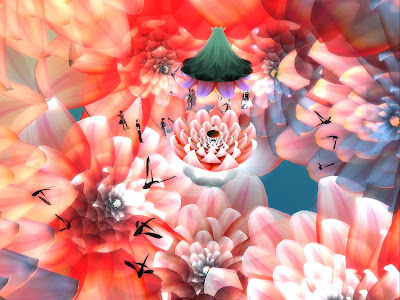 And to be honest, I felt it :) This has to be the single most beautiful work in SL. I can't wait for Dusan to rez it somewhere. Please keep us updated. And thank you for your wonderful sharing. Also, thank you Eshi, I'm in awe of you're talent, your mind and you're heart. Least not forget, you're soul. :) (the Open ID thing doesn't work for me. But, this is Gary Kohime. 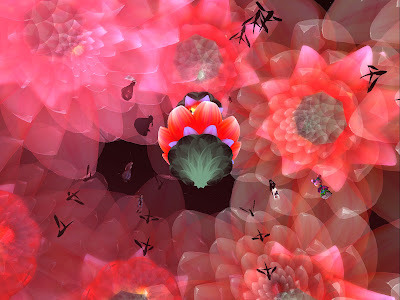 eshi's outstanding with her creations, and this one is no excemption! thank you eshi for creating it and thank you npirl for letting us all know! bettina, unfortunatley, some people in SL don't even know how great it can be, so its not just those who are outside sl that we should worry about, but those that are inside, oblivious and unaware of beauty such as this. 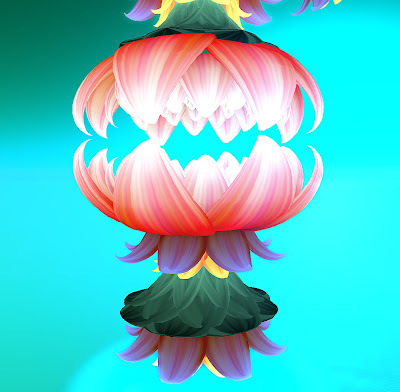 I officially handed over the Really Big Floral Creation Crown over to Eshi immediately on seeing this thing. Ummm....I -did- have that, right?